Her career has been rooted in one goal: helping the hundreds of hearing-impaired students she’s worked with develop the soft skills necessary for social interaction. 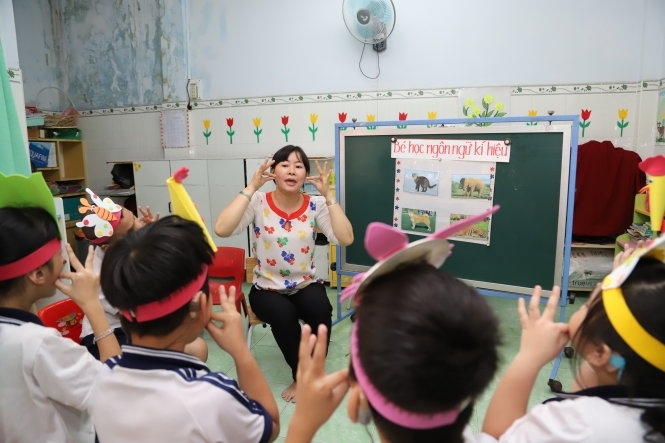 A Vietnamese teacher has dedicated the last 20 years of her career towards working with hearing impaired children at a school in Ho Chi Minh City so that her students might have a better chance at successfully integrating into society. Lam Thi Minh Chau’s career has been rooted in one goal: helping the hundreds of hearing-impaired students she’s worked with at Hi Vong (Hope) School develop the soft skills necessary for social interaction. And what does she say is the secret to her success? One little word: Patience. It’s surprising that Chau was never formally trained to teach deaf children. “I studied kindergarten education for regular children without disabilities but my first students after graduation were hearing impaired,” Chau said. Chau’s first days on the job were not easy. The then-24-year-old teacher clumsily tried to communicate with the children without knowing sign language and, even to this day, recalls the feelings of confusion and despair she felt during her first days on the job. Her inability to communicate remained a huge obstacle, and many of her students were completely unable to communicate with her. All she could do was staring hopelessly at her students for those first few days. But things quickly began to change. Understanding that communication was crucial for helping the children, Chau began to learn sign language. Her inspiration was drawing parallels between her situation and that of her students: while they struggled to integrate into society, she struggled to integrate into their world. Even though she was supported by her colleagues, it was her students who often stepped in to offer help. They’d help her learn sign language, instruct her, and let her into their community. Teaching students to communicate, write, and do maths, are just a few of Chau’s responsibilities. “The most difficult thing about teaching the deaf children is understanding what they want to say,” she shared. Before she teaches them to communicate like her, she must learn to communicate like them. Not being professionally trained to teach disadvantaged children, Chau has come across many struggles, especially in helping develop her students’ limited hearing abilities. “The greatest motivation for me is seeing a child’s development,” said the young teacher explaining that in many cases the students travel long distances just to be able to study at quality schools for the deaf. One of such students is Le Tran Duy Luan, 6, whose condition has significantly improved since he started attending Chau’s classes. “Our child became much more responsive. He began to understand us and his friend. He’s definitely developed beyond our expectations,” Luan’s mother said. Even though Chau prides herself on seeing the children improve, she hopes that one day they will be able to learn at a regular school, where she believes as a brighter future awaits.